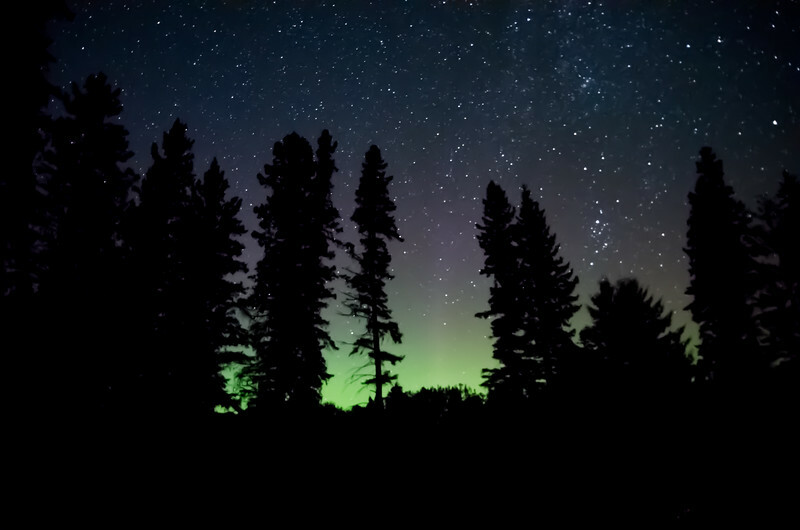 Observing dancing colours in the night sky is a delight often bestowed upon the residents of the Canadian prairies. Since I was a child, I have loved hanging out on a starry night, waiting to see if the auroras would do their diggers or remain elusive. It’s a quiet time, often a time for thinking and reflecting upon the beauty of nature’s offerings. My first photographic experience with the aurora borealis was in the summer of 2015. I was parked alone on a beach with the sound of lapping waves and a gentle breeze rustling the leaves of the trees in the forest behind me. I set up my gear. Although I was a little freaked out, I was determined to go home with at least some colour captured in my frame. Amazingly, a hint of colour did appear in my frame, and I was hooked! I often go out with a friend or family member so that I’m able to focus on the beauty of the experience rather than the irrational fears that accompany me when I am alone in the dark. I am in awe of the auroras, and of the spectrum of colour and light that a camera can capture. If you have never viewed the northern lights, be sure to add this experience to your bucket list. It really is amazing! See you under the auroras!